This guide will teach you how to buy ZEC from square one (i.e., all you have is fiat money, no cryptos). It will also work for most other cryptocurrencies, but as I’m interested in ZEC right now, I am going to write a quick foreword about it and then we’ll get right into the meat of the guide. A Little About ZEC — Why Buy? There is a massive subset of people who are new to the crypto-space entirely but have only heard of Bitcoin. Then they go online and they search around and figure out there are actually many, many cryptocurrencies out there with many different use cases. Zcash’s raison d’etre is privacy, the same as coins like Monero and Verge, which I’ve previously reviewed. At the time of this writing, Zcash is the #2 privacy coin by market capitalization. Later on, I intend to heavily explore the technical differences among the various privacy coins; this way we can see how they stack up to each other and if their respective market shares are well-warranted. For now, though, this particular article is intended solely as an overview of Zcash and its basic features. This is the tweet that first encouraged me to start writing about cryptocurrencies (originally on Medium, but now here). I knew that this tweet would generate a lot of hype. More importantly, I knew that he was right — there are many reasons why functioning privacy coins should succeed in the long term. I won’t waste time getting into these reasons, however, as I’ve already explored them pretty heavily in my Monero article. Instead, we will take the importance of privacy coins as a given and focus on what Zcash can do. Sender is obfuscated. No third party knows who the sender of any transaction is. Even people who receive transactions cannot know who the sender is unless they are told. Recipient is obfuscated. No third party knows who receives coins. Value is obfuscated. No third party knows how many coins you receive. Fungibility. Due to all of the above obfuscation, there is no such thing as a “history” for ZEC coins. This means that specific portions of Zcash cannot be blacklisted from exchanges, services, or merchants. The above features are what I would consider the basic and necessary components of any privacy coin, but there is a major component I’ve left out: zk-SNARKs. This is some real next-level stuff, and I’m going to try to explain it without getting too technical. This stands for “Zero-Knowledge Succinct Non-Interactive Argument of Knowledge” — real easy to remember, right? — and is arguably the most unique and important feature of Zcash. So, what does this actually mean? Basically, this is a method of using cryptographic techniques to allow one party to prove to another party that a particular statement is true, without revealing any extra information. The example given on the site is the idea of proving that a number exists with a particular hash value, without revealing what that number is. I realize this is all pretty heavy stuff but suffice to say it’s a sort of next-level cryptography which could revolutionize things like smart contracts. Zcash has unique features outside of privacy. Mining it, for example, is done via proof of work just like Bitcoin; unlike Bitcoin, it is based on the Equihash algorithm. Historically this provided some amount of ASIC (“application-specific integrated circuits”) resistance; that is to say, there were no microchips designed specifically to mine via this algorithm at extreme hashrates. This is no longer the case now that Bitmain has produced ASICs that are Equihash-savvy. This has generated some amount of controversy, but for now it’s safe to say that Zcash is not ASIC resistant and is therefore more likely to be mined by “big time” mining consortiums. Depending on who you ask, this might be a good or a bad thing, but it is undeniably one of the major differences between Zcash and its main competitor Monero. I could go on, but I believe I’ve laid out a good case and overview for Zcash. With that said, let’s do a quick price comparison. At the time of this writing ZEC is ranked #20 among cryptocurrencies by market capitalization and is priced at $183.32/ZEC. However, this is not an ERC-20 utility token we’re talking about here. This is a coin with its own blockchain that is well-established and is markedly superior to Bitcoin when it comes to privacy. It is also, as I’ve previously mentioned, exploring the bleeding edge of cryptography with its take on zero-knowledge proofs. Thus, Zcash is one of the few cryptocurrencies that could realistically take a shot at the king — or at least steal some of his market capitalization. At current prices, if Zcash were have the same market cap as Bitcoin, it would be worth over $28,000 — about 150 times the current price! If this number seems outlandish or surprising to you, bear in mind the fact that Zcash has far fewer coins in circulation than Bitcoin — something like 4.5 million vs 17 million as the time of this writing. Thus the price of each individual coin is affected more powerfully by changes in total market capitalization. Now, I don’t necessarily believe that Zcash will displace Bitcoin, but I do believe there is a long-term place for a privacy coin in the crypto market space. While Zcash is currently behind Monero by market share, there’s no telling what could happen in the future. Now that you understand the basics of Zcash, let’s learn how to buy some! Move your ETH to Binance. 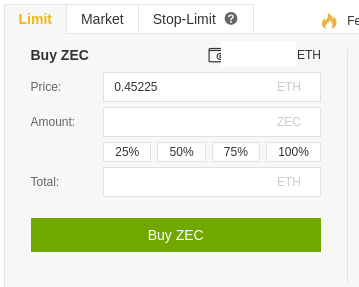 Once it has confirmed, you can now easily use the ETH/ZEC trading pair to buy as much or as little Zcash as you want. More on trading pairs later. Send your coins from Binance to a safe ZEC wallet for long term storage if you intend to hold for awhile. This is not strictly necessary but it is considered a safer option than keeping ANY coin on ANY exchange long term. I personally believe Coinomi to be the safest and most convenient wallet for many cryptocurrencies, including ZEC at this time. As far as hardware wallets, the Trezor supports Zcash and the Ledger currently does not. Once you are up and running there are a number of options when it comes to actually paying for coins via Coinbase. 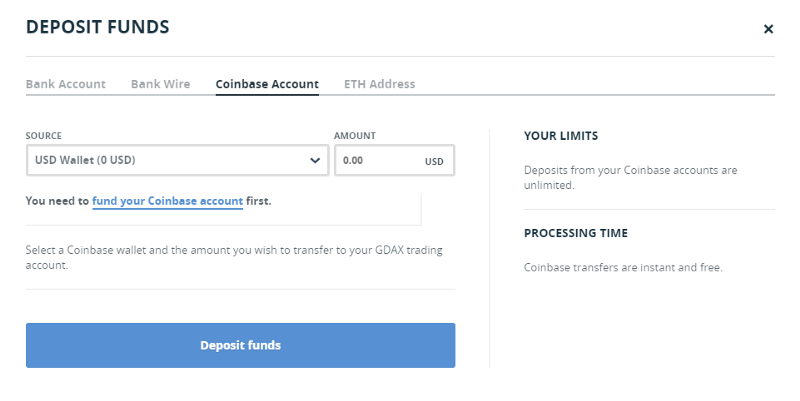 It is possible to link your bank account to Coinbase but actually transferring coins out of Coinbase will be impossible for a few days while the funds are clearing. This is obviously not ideal if you want to move quickly, as you would now have to wait several days to move your coins to an exchange where you can trade them for ZEC (or any other coin). In my opinion if you intend to buy lesser-known coins like ZEC, ETH is the best choice to buy here. Why? Well, with regards to LTC, the reason is clear: other exchanges like Binance offer direct trading pairs for BTC and ETH, but not LTC or any other currency. What this means is that you could directly exchange your ETH for ZEC, or your BTC for ZEC, but you’d have to perform another step if you wanted to trade your LTC for ZEC (and that means more fees!). Obviously we don’t want to waste even one cent if we can avoid it, so LTC is out. Now is the time for you to make your Binance account. Follow the link and create an account using a strong password (this should be different than the one you used for Coinbase!). There are other places where you may be able to buy ZEC (Changelly, Kraken, EtherDelta, HitBTC, etc.). I cannot directly recommend most of these exchanges as I don’t have much experience with them at this point — however, I can say that I have used HitBTC and KuCoin and they have worked well for me. This guide focuses on Binance because my experience there has been 100% positive — I have transferred coins in and out of their system many times with no problems. Once you click Send, you will need to wait a little while. Without getting too technical about it, exchanges want to be as secure as possible. Thus, when you make a deposit, they wait for multiple “confirmations” from the network before allowing you access to your funds. You can view the progress in your Binance account by clicking Funds and then History. Do not be alarmed if nothing shows up at first! There are many reasons there might be a slight delay. In general you should see the transaction show up within a few minutes, with the current number of “confirmations” next to the number of required “confirmations” next to it. Be patient — your ZEC is nearly in hand! Once you have the required number of confirmations, it’s time to trade your ETH to ZEC. This is blessedly simple. In the front page of Binance, click “ETH Markets.” Search for “ZEC/ETH” in this list, and click it. Now you are on the trading page. In the bottom left under “Buy ZEC”, click “100%” below the “Amount” field. This indicates to Binance that you’d like to trade all of your ETH for a commensurate amount of ZEC for no more than the price listed above. The price field is automatically listed based on the current market. If you like, you can change it to a different price, but like any market it’s not guaranteed that someone will buy at the price you’d like. Your order will remain open until it’s been fully filled or you cancel it. There are several options here such as Stop-Limit orders, etc., but this is outside the scope of this guide. In this case, you are simply placing a “Limit” order for some ZEC. If you want to be done now, you can be — but there are more steps if you want to be security-conscious. You may want to check under the “Orders” and “Order History” tabs that the order went through — if you placed a Limit order at the default price, it probably did. Once you have your ZEC in your Binance account, you can see them under “Funds” → “Deposits Withdrawals.” You can click “Hide 0 Balances” at the top to clean up the screen of coins you don’t own, and you can see an estimate of the overall converted BTC and USD value of your account at the top right. In Binance, go into the “Deposits & Withdrawals” tab, then click “Withdrawal” to the far right of the “ZEC” row. By now it should be clear what you’re looking at — fields that let you input the address to send the coins to, and how many coins to send. For your convenience, there is a “Max” button to the right of the Amount field. Note that once you click “Submit,” you will need to use your two-factor authentication via Google Authenticator, an Android app. I recommend you do not use your actual day-to-day phone for this purpose. These days you can get an inexpensive Android phone for around 30 dollars — this is an investment worth making for security purposes. You can keep the battery removed from the phone when you’re not using it, and connect it to a network only for cryptocurrency purposes. As a bonus, if you’d like, you can use this phone for the Coinomi wallet. It is possible to get ZEC working in Coinomi right now and the process is as simple as it is for any other supported coin — see my wallets guide for more details on using Coinomi. In my opinion this is the preferred method, especially if you’re willing to buy an Android phone solely for cryptocurrency use. However, if you’d prefer to use a hardware wallet, Trezor is a pricier but arguably more secure option. Be advised that the information here only scratches the surface on Zcash and cryptocurrencies in general. I recommend you read as much as possible. Cryptocurrencies are the future, and if you’re reading this guide you are already lightyears ahead of the curve.